lt to do! Bet you did not know that. So the truth is I know things are going to turn around; I simply don’t know when. The late Sir John Templeton, founder of the Templeton group of international funds, said the next bull market starts at the height of pessimism. Yes, I do invest in some of those funds as well as real estate. I also know that the stock market is up approximately 15-18% from its low a few weeks ago. While we still see bad news coming at us from the media, this is good news. Is it going to continue its upward trend at this time? I don’t know but we do know with some degree of certainty and historical perspective, that over time it will. Now this brings me to real estate where I’m more at home, no pun intended. I see encouraging signs here as well. 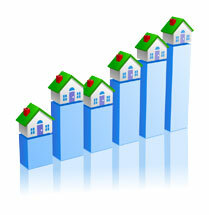 Sales of existing homes nationwide increased 5.1% from January 2009 to February 2009 according to the National Association of Realtors. That isn’t true for Breckenridge but the largest percentage of home sales occur during the summer months, not the winter months and particularly not after Christmas. The second part of this equation is that the medium price of homes dropped. So what I’m trying to relate to you is this just might be a good time or even the best time, if it is within your means, to look at some additional investments in real estate. Since we are not out of the woods yet economically, I would also caution that if this could put a strain on you financially, then this probably would not be a wise choice at this time due to uncertainty. However, if this is within your means which I’m sure it is for many of you, then I personally think this is the time to look seriously at the opportunities here in real estate. There is a much larger selection of properties available and some great values in my opinion. Right now, in 2009 we’re seeing inventory like we’ve never seen before, interest rates are at an ALL time low and prices have dropped for the first time in nearly 2 decades. NOW is a great time I believe to get involved! I hope this finds you well and I look forward to hearing from you. We have a lot to be thankful for and I wish you the best. Voted Top Realtor in Summit County 03, 04, 05, 07, 08.